As its “name” indicates, this is such a small summit that people don’t even bother to give an unofficial name. The name is merely its grid reference on topographic map. 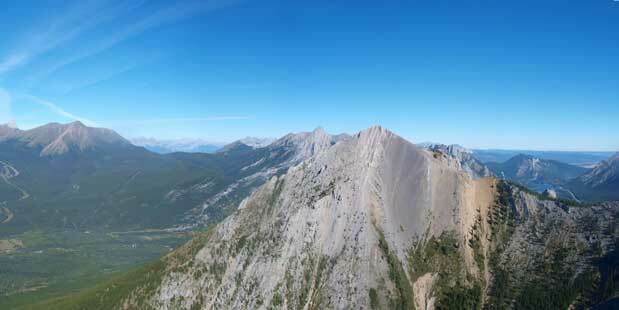 The bigger peak immediately to its east side is also unofficial, but at least has a name, Kananaskis Peak. 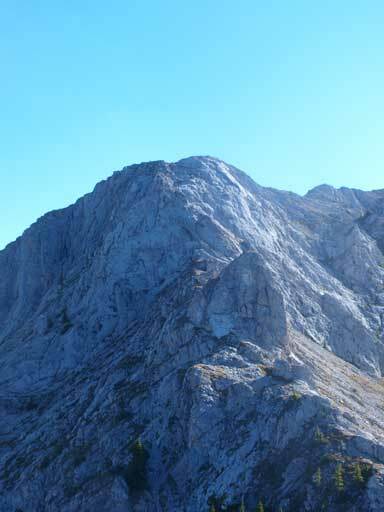 The prominence of GR338442 from GR/Kananaskis col is probably only about 20 meters, so I don’t quite understand why Andrew Nugara listed it as a separate objective in his More Scrambles in the Canadian Rockies book. 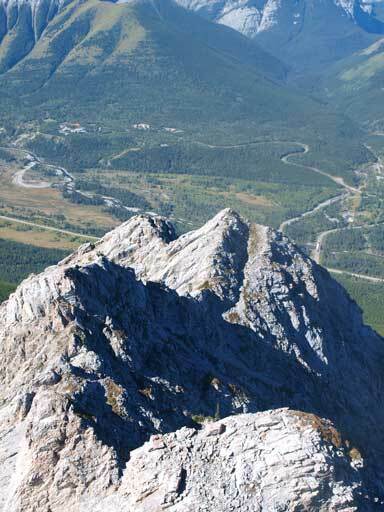 The only reason is probably because it appears like a “peak” viewing from Kananaskis highway. Since it’s covered in that guidebook and I’m intended to finish Nugara list at some point, I have to tick it off. Combing with a bunch of nearby unofficially named peaks plus Mt. 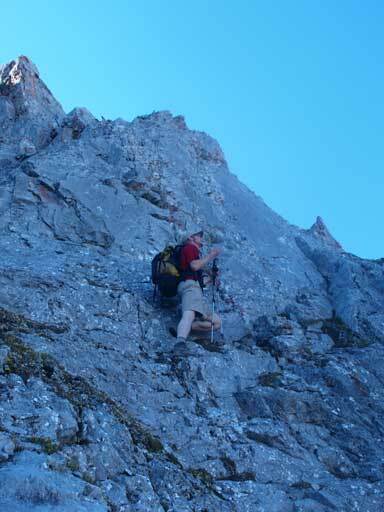 McDougall, it forms a nice, but quite long multi-peak traverse. On a nice September day, Neil, Tyler and I decided to tick them down all together in one shot, and this is the third objective on this day. From Kananaskis Peak, this GR doesn’t look at a peak at all, but rather a bump on the west ridge… However, we actually got the most exciting scrambling in this day on this part. 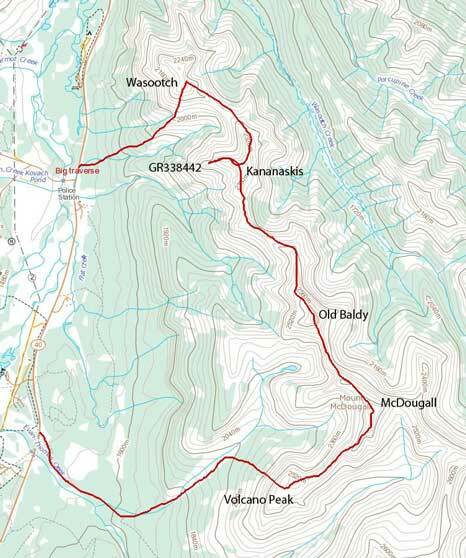 There was about maybe 200 meters of elevation loss, with only 20 m regain at the end…. It felt pretty strange to bag a peak by mostly descending. 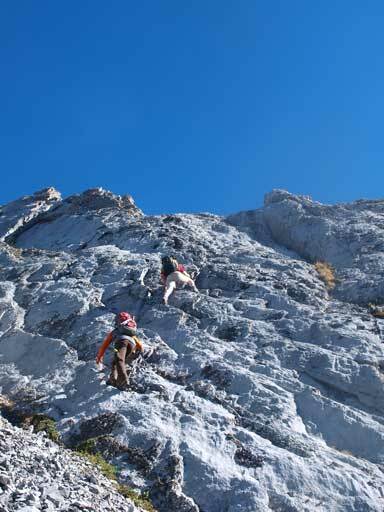 Following the ridge, we encountered moderate terrain here and there, until at a shear drop-off. The route goes on skier’s left on scree. 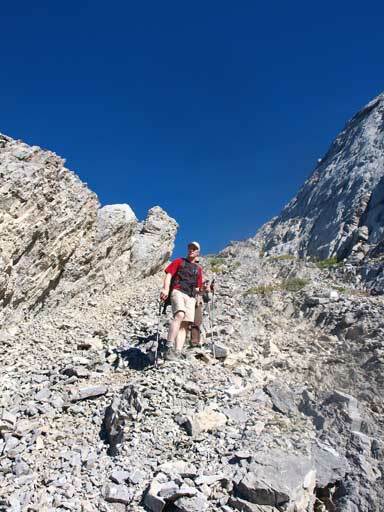 The scree wasn’t fun at all. 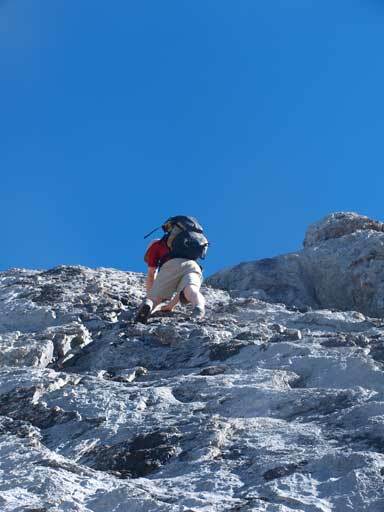 Once the scree was over, we traversed back to the ridge crest on tedious rubble. 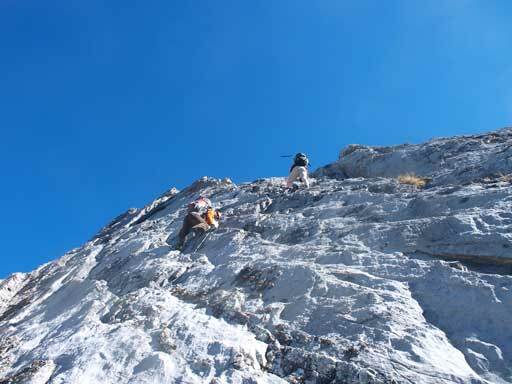 Right before the summit, there’s option for difficult scrambling if you want. I bypassed it on the right side while Neil and Tyler climbed head-on. 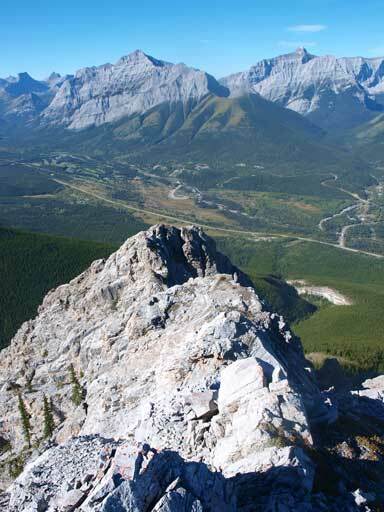 The summit offers more unobstructed view down to Kananaskis Valley. 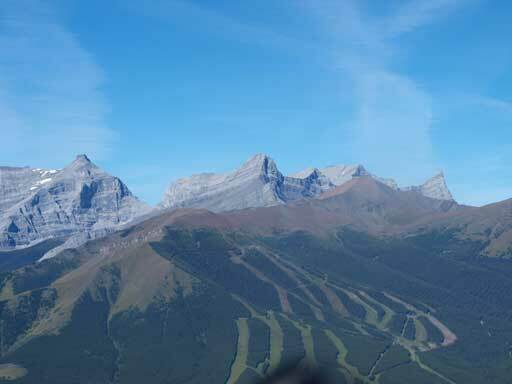 Looking towards Wasootch Peak from the summit. Neil and Tyler enjoying the 3rd summit of this day. It’s pretty discouraging to see Old Baldy Mountain from GR338442… It’s a long way to go, so we didn’t rest but immediately turned around towards Kananaskis Peak. 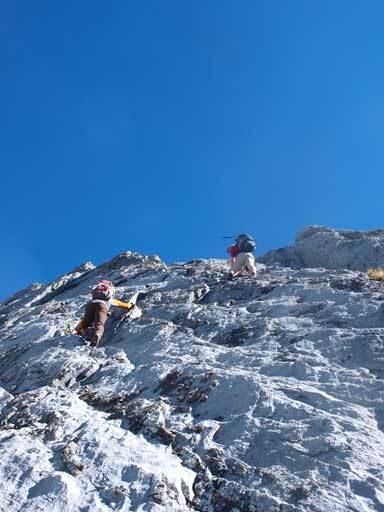 Once at the scree section, we decided to “scramble” up that slab wall. I guess Neil and Tyler wanted to see what’s all about Mt. Northover… Anyway, it’s pretty fun to get some slab climbing. 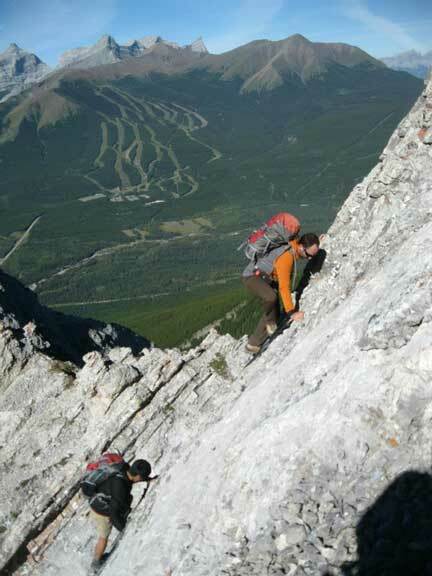 Soon we got back to Kananaskis Peak’s sub summit. 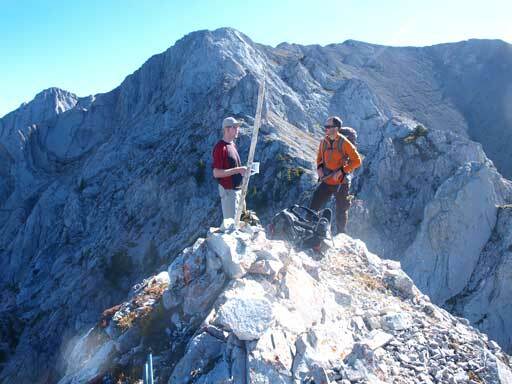 Now we could focus on the traverse to Old Baldy Mountain. This following section was not the most difficult, but definitely the longest and the most time consuming section of “the Big Traverse”.